So when wordpress.com announced the idea of making blogging buddies, I pounced on it like Captain Haddock on Loch Lomond whiskey. Though there were lots of people who were posting comments saying that they would “like a buddy”, no one was really making an effort to go out and propose buddyness. That’s when I came upon a wonderfully named blog: Its Haphazard. I was looking for someone a little medical-ey to patch up with in order to do the group blogging thing, but although this was nothing what I was looking for, I ended up requesting the author to be my blog bud. And Voila! I had my first blog mate! Since then, I have garnered 16 blogging buddies and hope that we can maintain this webring in the days to come. So, I decided to give something back to these wonderful blogging friends: I decided to go through their blogs and sort of post “reviews” on what I thought of the whole deal. In doing this, I figured that I would generate some link backs on their blogs, give their blogs some page hits and hence, some search engine love. Come on, who does not want to be top of the Google tree? I also figured that if my blog friends were true to me, they would return this favor and I would end up getting link backs from them, and hence, some serious search engine love (I am not even speaking of the page hits!). So, here I go: Casey, hope you don’t mind I chose to dissect your blog! By the looks of her About Me page, she seems to hail from Monaghan, Ireland, but I suspect she moved there from someplace else. Phillipines? Correct me Cas, if I am wrong. She is going to secondary school and wants to take up communications, with fall back options of Journalism (which I think she would be great at, given her writing prowess!) and computer science (meh!). she is not very forthcoming about herself, her goals, her outlooks on life or her philosophies, and she says that people may not be interested in all that: but honey, they are! When I read a blog, I would love to get to know the person better, see where they are coming from: what they want to do in life, how they see things, etc. She started blogging this New Year with quite the right idea. What impressed me was the fact that she realized that her writings may not be massively intriguing but, at the same time, she expressed the wish to go and out her stuff out there: something which took me a couple of years to go ahead and do! Kudos there, mate! She did not really have a great beginning to the year, and I feel sorry for her, but at the same time, I wish her that the next time around, its going to be freaking awesome! Some of her posts really bring out her sweet, caring and sensitive side. Like this one, where she speaks of tending to her drunk grandpa who got into an accident and was left in a bit of a lurch (and in my opinion, it was, eventually, such a waste of time for her, but then again, I am a skeptic guy). The fact that she could not meet him before she skipped shores and still wonders how he is doing is ample testimony to the fact that she is such a kindred soul! She is a Manga Fan. I have no idea what manga is: maybe some kind of comic, I may have to ask the Google gods about it, but for those of you out there who are Manga maniacs, check out her review on 7 seeds. 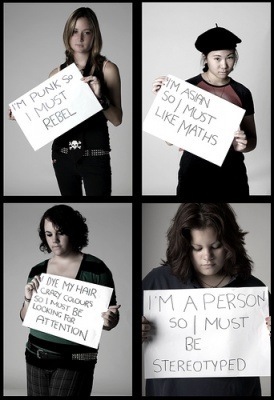 This just makes some teens not show their real personalities since what they think is that they have to fit in the community, or be accepted in a group. Sometimes it’s also other teens who make others get into this stereotyping thing, saying that they won’t be friends with someone if they don’t dress, talk, or think the same way as they do. I feel bad for those who try their best to fit in and have friends but they just don’t realise how those are not real. In the end they are the ones who are still left alone, and some would even try on switching to a new stereotype. She gets overwhelmed often, and her rants spill over onto her blog and give us a good peek into her life. She talks of being stressed out by her mom (who isn’t honey? ), while at the same time, her love for her mom is evident. She has the ability and sense of humor to take it all in stride as well! One thing she is really scared of is making even the slightest mistake. While I understand her concern for being on top of things, and not wanting to disappoint other, which is totally rational, I would like to remind her that courage is not the absence of fear, but doing something despite the fear (or something like that: come on, you must have heard it in a movie! They say it all the frigging time on the screen!). Since there is a huge possibility of me running off on a huge, long-winded, and utterly soporific rant about this, I will cut myself off short and say that she should follow the Nike motto: Just do it! She has an over-protective boyfriend who zealously guards her from all online predators whom he considers detrimental. Whilst some may find it sweet, I find it a little asphyxiating. Thank God he’s in Ireland where his ire I can feel only via the wire (poor pun. Sorry.). While I find reading about relationship related posts (the introspective ones, not the coochie-coo-coo types) a blast, she is pretty tight lipped on the issue. Come on Cas, lets get more dirt out there (*runs from angry boyfriend*)! Her blog uses the Modularity Light (brown background) theme with white fonts for text. Not my favorite combination, since I am all for the black-white-minimalism thing on themes, but is, in general uncluttered. There aren’t too many widgets and stuff from the MySpace age trying to destroy your retinas. Her writing is strong, usually well edited, and one can feel she puts her heart into it. Now this maybe because I have always wanted to visit Ireland (especially after seeing P.S. I Love You – I just fricking love that movie, don’t you? ), I would like to see more pictures on her posts, more stuff about how she copes with the change in her life, with having to move to a new place, new school, with the distance from her family: more intriguing stuff about her life. And one more thing she needs is a Contact Me page with one of those nifty contact forms that wordpress so easily lets us embed, so that we, her loyal readers, can get back to her easily! Tags: Blogging, Blogging Buddies, Wordpress. Bookmark the permalink. Previous post ← Blog Buddies, Ahoy! Wow, you’re really thorough Dr. Skeptic! Nice analysis. Meaningful, but still friendly. I’ll definitely give it some serious thought though. I LOVE Tintin! 🙂 I still devour them. Tintin is the bomb diggity! Excellent! Again i like the picture – this inspiration bug has bee caught by the doctor! Thank you! 🙂 Indeed the bug has bitten me! Nicely done, Doctor. I have to say without your flow diagram I may never have understood the path to becoming a famous blogger! Keep on dissecting – I’ll be reading! Thank you. I know, the path to famous bloggership is not easy, eh? You can com dissect me anytime your ready – just remember what’s good for you is good for me too! I am going to check out this blog tonight! Wow…what a thorough analysis! Can we be blog buddies as well? I would love the feedback and encouragement, and promise to comment on yours as well! Sure. Why not! The more, the merrier! 🙂 Off to subscribe to your blog, then add you to my buddy box! Wow, this is a great post! Plus it’s me as the topic! Haha. You’re welcome! 🙂 Least I could do for a blog buddy!